Not really, as it turns out. With a few exceptions, most of our snakes cost between $36 and $52 a year to feed — 70¢ to $1 a week, sales tax included. The exceptions are the big snakes, who eat rats (which are significantly more expensive); several snakes whose heads are too small to wrap around the mice they should be eating, and who, as a result, eat smaller mice more often; and one obese glossy snake, who’s getting small and infrequent meals as a result (when you’re a lizard specialist, an all-mouse diet in captivity is a little rich). Those exceptions aside, snakes that eat larger meals tend to have them less often: larger mice tend to be more expensive, but you don’t need to feed them as often (at least with the species we keep). One adult mouse every two weeks costs $4.36 less per year than one hopper mouse every 10 days, and one hopper mouse every 10 days costs $11.62 less per year than one fuzzy mouse every seven days. But rats are more expensive than mice: one rat every three weeks costs twice as much as one adult mouse every two weeks. Much to my surprise, the sweet spot is adult mice, not fuzzies or hoppers, which are cheaper, but need to be fed more often. 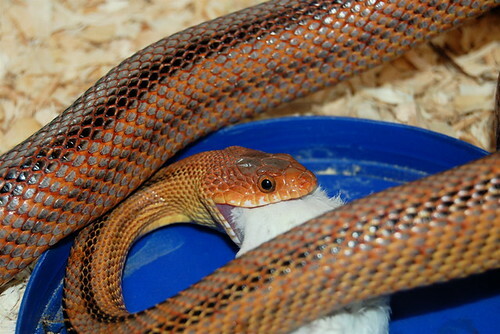 A third of our snakes eat adult mice already. But the third that eats fuzzies will probably never change: for the most part, they’re small species and they’re already full-grown. And the five snakes that eat rats really can’t eat anything else. There isn’t much that can be done: they eat what they eat, and it costs what it costs. But when you go through a thousand feeder rodents a year, every dime saved per mouse saves you $100 a year. So it may be worthwhile shopping around to see if we can get better prices. If we have to travel great distances or pay for shipping, or buy a bigger freezer so we don’t have to travel or ship as often, that may eat up any savings, so it may not be worth it in the end. Still worth exploring, since we spend almost as much on mice as we do on cable.